​Los Angeles Chamber Orchestra (LACO) is presenting The Four Seasons, as part of Baroque Conversations. The Antonio Vivaldi series includes: Concerto in G minor for Two Violins, RV 517. Concerto in A minor for Two Violins, RV 522 (L’estro armonico), and The Four Seasons (Le Quattro stagioni). The concertos were inspired not just by the seasons themselves, but by a set of four sonnets written about spring summer, autumn and winter. Speculated to be written by Vivaldi himself. The Four Seasons is a LACO staple and has been performed by the Orchestra over 35 times. The performances take place at three different venues on the evenings of December 11, 13 and 14. What really makes this special is the leader, world-renowned Mandolinist, Avi Avital. Originally written for solo violin, the performance features Avi Avital’s virtuosic arrangement for solo mandolin. 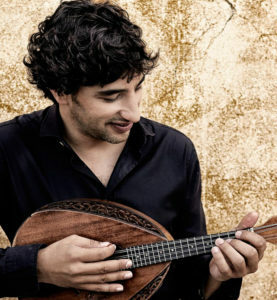 Avi Avital is the first mandolin soloist to be nominated for a classical Grammy. A Deutsche Grammophon artist, he has recently appeared with the Chicago Symphony, Los Angeles Philharmonic and St. Louis Symphony and in 2018-19 makes his debut with the San Diego, Seattle and Detroit symphonies, as well as his debut on the main stage of Carnegie Hall with Orpheus Chamber Orchestra. Born in southern Israel, Avital began learning the mandolin at the age of eight. He later graduated from the Conservatorio Cesare Pollini in Padua, Italy, where he studied with Ugo Orlandi. The Orchestra’s signature baroque series explores the genesis of orchestral repertoire from early Baroque through the pre-classical period. I recommend one takes a look at the Adventure Packs from LACO that offers discounts and flexibility with your schedule – easy to exchange tickets. They are Final Four, Pushing the Envelope and Regal Classics. These four concert packages are geared to the first-timer, however, old-timers should not pass on the packs. You can order packages for performances at the Alex Ford Theatre in Glendale (Eastside Concert Package) or Royce Hall (Westside Package). Los Angeles Chamber Orchestra’s The Four Seasons, was an excellent musical fusion of violins and mandolin. Led by concertmaster Margaret Batjer, who maintains balance by communicating with the musicians and allows them the freedom to do their best work. Also impressive, is how well the orchestra and soloist work together. The program begins with Vivaldi’s Concerto in G minor for Two Violins. Josefina Verga, and Sarah Thornblade perform with elegance conveying all the colorful twists. Josefina Vergara joined the Los Angeles Chamber Orchestra in 1999 as principal second violin. Sarah Thornblade, who first joined the Los Angeles Chamber Orchestra in 1999, is the Orchestra’s associate principal second violin. We move to Vivaldi Concerto in A minor for Two Violins, part of a collection of concertos called L éstro armonico, which means musical inspiration. Mararet Batjer and Tereza Stanislav perform fervently with attention to the nuanced style. Next, the highlight of the evening is the Grammy nominated and world-renowned mandolinist, Avi Avital who led The Four Seasons. Avital speaks to the audience, introducing the Four Seasons and the meaning behind the music. He described the sonnets written by Vivaldi and how the music expresses the vivid details of the season such as the sound of thin ice in winter. “Feel the music,” he tells us. And feel we did — through Avital’s masterful interpretation of the concertos and the mandolin blending perfectly with the LACO ensemble. There are musicians that play with precision, and those that play with feeling. And then there is Avi Avital. He is a magnificent, mystical and passionate artist who radiates the stage with energy from above. He is quoted as saying, “God put a mandolin in my hands…” and, if you have not experienced Avital in concert, you are musically deprived. Live with Avital is a deep moving experience — nourishing the soul. He cradles the mandolin not only as an instrument, but a tool to connect on a profound level, a high which he then expresses and exudes to the audience generously. The magical musical evening by LACO, ends with a thunderous standing ovation for the Israeli virtuoso, Avi Avital, who offered “something different” for his encore — one of his own solo pieces. This concert by Los Angeles Chamber Orchestra (LACO) was given on Thursday, December 13, 2018 at Zipper Hall.